Mammut is a program for Linux, Windows and Mac that do sound processing in the frequency domain. The program makes an FFT, a “fast Fourier transform” of sound in its entirety. Various operations can then be done in the frequency domain, such as non-linear stretching of the spectrum and spectrum shift. Mammut is a rather unpredictable program, and the user must get used to letting go of control over the time axis. The sounding results are often surprising and exciting. Mammut is also ideal for common operations such as filtering, spectrum shift and convolution and it provides an optimal performance. Making a “mammoth FFT” in the entire sound, instead of splitting into short windows are unusual. One such method involves the development over time as a part of the spectral coefficients in a non-intuitive way, and changes in the frequency domain could alter development in the time domain. Mammut uses a conventional radix-2 FFT, but the number of points in the analysis are typically several million, and not a few thousand which one is used in short-FFT. Signal processing routines in Mammut is mainly designed and programmed by Øyvind Hammer, the user interface is mainly made by Kjetil Matheussen. 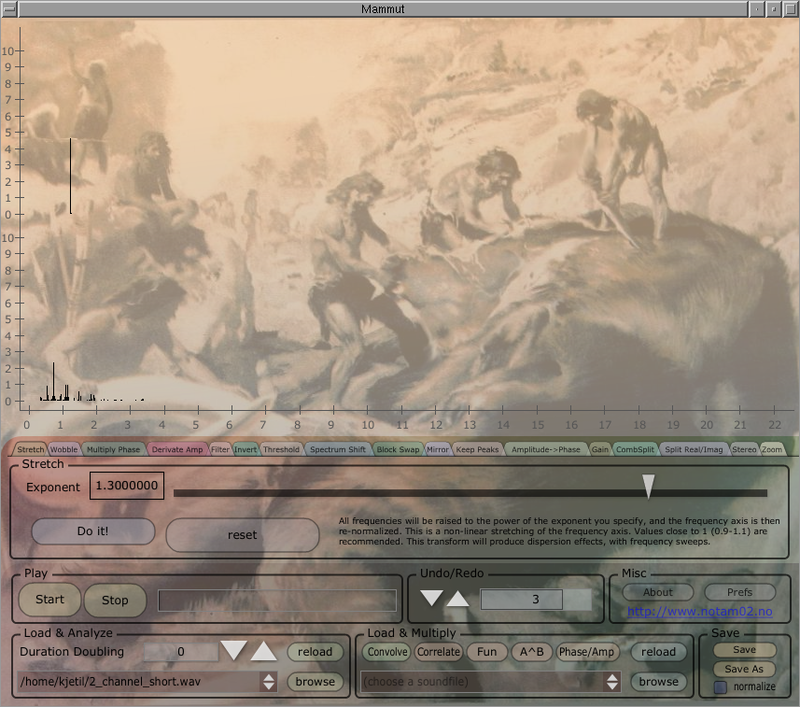 HyperMammut, another mammut based on Notam’s Padsynth which is used in ZynAddSubFx.